A mother who threw her newborn daughter down a rubbish chute when she had severe post-natal depression can be released from jail, judges have ruled. Jaymin Abdulrahman, 25, was jailed for two-and-a-half years after the baby fell more than 40ft (12m) at a Wolverhampton block of flats last year and suffered skull fractures. Abdulrahman has now had her sentence cut to a year by the Court of Appeal. Three appeal judges said their decision would mean she could be released. Abdulrahman, of Wolverhampton, was convicted of inflicting grievous bodily harm on the baby girl and was jailed for 30 months at Birmingham Crown Court in June. But she was found not guilty of the attempted murder of the six-day-old girl and cleared of a separate charge of causing grievous bodily harm with intent. Appeal judges on Tuesday concluded the sentence was too long and that she had already served enough time in prison. Lord Justice Laws, who sat with Mr Justice MacDuff and Mr Justice Dingemans, said: "The only explanation for what she did was an acute ... psychosis. "Culpability must be extremely limited. In the circumstances she should be released." Jurors had heard the baby, whose name cannot be published for legal reasons, had been thrown down the chute in September last year and suffered "catastrophic" brain injuries. 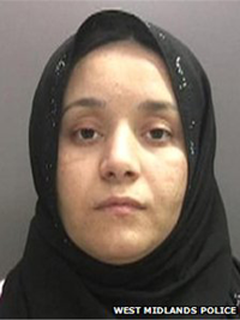 Trial judge Mrs Justice Thirlwall had said she accepted the incident was not premeditated and Abdulrahman had been suffering from post-natal psychosis - a severe form of post-natal depression. But she told Abdulrahman, who is originally from Iraq: "You should have been her guardian."